Our Churches welcomes young families and has plenty going on for the younger members of the church and the village. Babies and young children are very welcome at our services; there is a play area for small children with seating for supervising parents - still allowing them to take part in the service. We also provide activity bags for use in the pews. The toilets offer a nappy-changing area. Whatever! 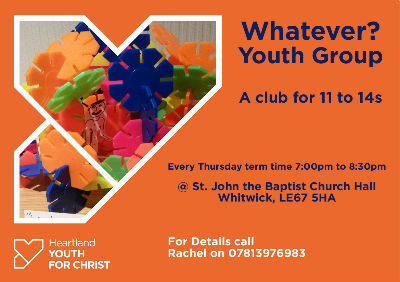 Youth Club is for ages 11 - 14 and meets on Thursdays 7 - 8.30 pm in term time at the Church Hall on North Street and includes Bible activities, arts and crafts, games and refreshments. Come along for a fun-filled evening.